Joe Henry produced it. You should go buy it. British duo Chas & Dave (Chas Hodges and Dave Peacock) will release their first album of new material in 27 years. The album will revisit some of their early work as well and feature guest spots by Albert Lee and Hugh Laurie. And, of course, Joe Henry produced the entire affair. Okay, Brits, fill me in — I'm entirely unfamiliar with the work of Chas & Dave. Can't wait to hear it. It's due October 28. You can pre-order via Amazon UK here and read more about the record in The Guardian. 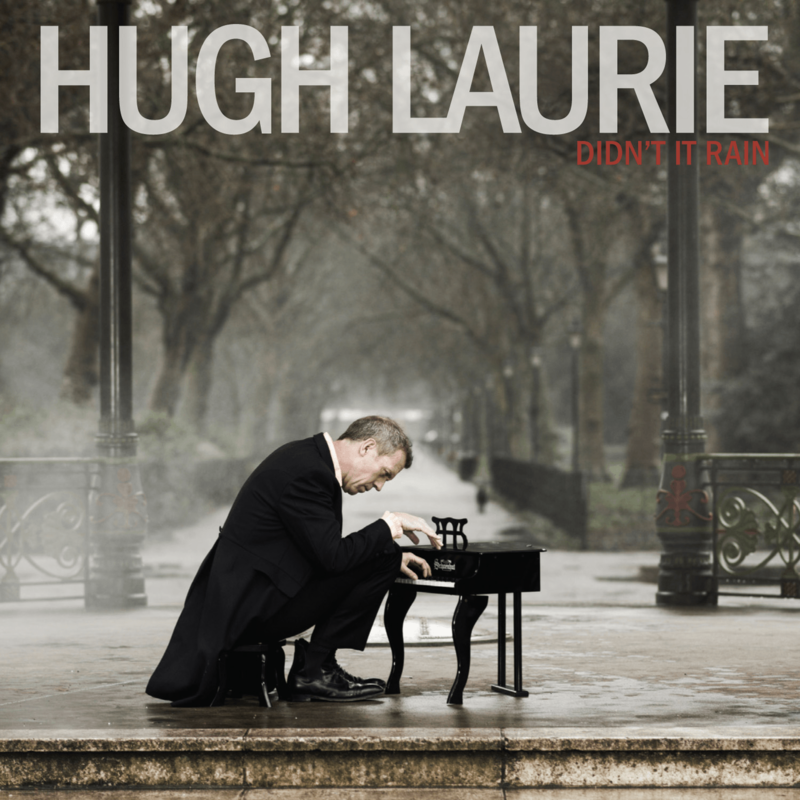 Hugh Laurie's latest JH-produced album Didn't It Rain will get a very welcome release in the U.S. and Canada on August 6. Pre-order information here. Read the recent review by guest blogger Josh Hurst here. Didn’t it Rain—the second album of American blues and folk songs from Hugh Laurie—begins with a performance of “The St. Louis Blues”—but I will caution you in advance that it does not contain anywhere close to all of the song’s sung verses. If you want to hear the song sprawled out in all its glory, I recommend an album called Louis Armstrong Plays W.C. Handy, where Satch gives us a “St. Louis Blues” for the ages. Here, only two sung verses appear, following an extended instrumental prologue that imagines the song as gleeful Dixieland—swinging harder than anything on the first Hugh Laurie album (something that could be said about the entirety of Didn’t it Rain, just about) and rocking and rolling harder than most anything that passes for rock and roll these days. When the first vocals do enter the song, they pick up on one of the middle verses, and it first it seems like an odd way to begin a record—not with anything that really resembles a beginning at all, but rather sounding as though we’re coming in on the middle of a conversation. Which, of course, we are: This is a song that is nearly 100 years old, and Laurie and his band are picking up where the song was left off. They are taking their verses just as rightly and freely as Louis did on W.C. Handy; others, I am quite sure, will follow, grabbing the thread from Laurie and adding their own perspectives to the song’s rich legacy. There are other ways in which Didn’t it Rain sounds like it picks up where something was left off. It advances the central argument of Laurie’s first album, Let Them Talk, which was that Hugh Laurie is legit, and that he has as much grounds to sing these songs as Louis Armstrong, Sister Rosetta Tharpe, Frank Sinatra, or Mick Jagger. But if the first record was a platform for Hugh Laurie, Didn’t it Rain assumes the matter of his blues cred more or less settled, and instead functions as a platform for, and a celebration of, the music that he so loves. There is no other way to explain this album’s utter egolessness—the way in which Laurie surrounds himself with such a colorful parade of “guest singers,” guests who sometimes overshadow their host, who seems quite happily to cede the spotlight and disappear into the music. (And to think some would have us believe that these albums are vanity projects—whatever that even means.) There is also no other way to explain the festive mood and careening energy here; the handsome and regal Let Them Talk was and is a fine album, but hearing it in the context of this new one almost makes it seem a bit academic by comparison. That album was an act of discovery; this one, a celebration. It’s a celebration—a real rager—that’s been going on for more than a century, and it picks up here midway through the aforementioned “St. Louis Blues,” where the first words are sung not by Hugh Laurie but by Sister Jean McClain. She can sing the hell out of any gospel or blues or whatever-else song you care to name, and she knocks a couple of tracks out of the park here. She is joined by a stunning singer from Guatemala, Gabby Moreno, who does a coy bilingual duet with Laurie on “Kiss of Fire” (the furthest we venture outside of Let Them Talk’s narrower focus on classic New Orleans blues, I think) and nearly steals the album with a smoldering and astonishing “The Weed Smoker’s Dream.” It’s my early vote for album highlight, and that’s saying something, because Taj Mahal is also here, singing a song that he loves, “Vicksburg Blues.” He does it with warm, easygoing authority—owning the song but not overpowering it, rather savoring and cherishing the very act of signing it, which in a way captures the spirit of Didn’t it Rain as well as anything else included on it. I should also mention that Hugh Laurie is working once again with producer Joe Henry; this is Laurie’s second LP and also the second that he has made with Joe, and already it is impossible for me to imagine that there could ever be a Hugh Laurie album without Joe Henry’s name somewhere on it. I would sooner believe that Wes Anderson might make a movie without Bill Murray. They work well together, and I think it’s because they’re united behind a shared worldview—one in which it is simply impossible to have too many versions of “The St. Louis Blues” or “Careless Love,” no matter how many thousands of times they’ve both been performed, and to suggest otherwise is simply baffling. And sure enough: When the parade of songs and singers slows a bit in the album’s more leisurely second half, Laurie lends his own voice to a take on “Careless Love,” and it’s a delight. We have heard the song many times before, but we have never heard it sung by Hugh Laurie, and that makes this version worthwhile—more than that, priceless. He doesn’t reinvent it but rather mines it for further revelation—revelation being something in no short supply, on this or any other song on the album—and brings out tenderness that’s disarming and wonderful. Laurie also sings lead on a spritely and soulful version of “Junker’s Blues” and the intoxicated, and intoxicating, “Wild Honey,” two songs that have “The Weed Smoker’s Dream” between them—and it that makes it sound like there is an awful lot of narcotic use and mental impairment on this record, it’s because there is, and why shouldn’t there be? Didn’t it Rain is a party, after all—a jubilant testimony to the sweet seduction of love and heartache, music and drink, all manner of holy vices. Laurie sings a song called “Evenin,’” as well, and no song on the record does more to make Let Them Talk feel like a warm-up lap. On that album, Laurie and Henry shook the dust off these old tunes, but here the music struts and swaggers, Laurie growls like he is having the time of his life, and in the middle of the song there’s an explosion of reeds that seems to take its cue from Henry’s own albums Tiny Voices and Blood from Stars—what more could we ask for, from this or any other record? Then Sister Jean has a showstopper with “I Hate a Man Like You” before Laurie unveils the album’s neatest trick: Following a dozen songs that are plucked from the backpages of American song, polished up and made to sound like they could have been written yesterday, Laurie takes a comparatively newer number—Alan Price’s “Changes”—and makes it sound like a traditional Mardis Gras number. Yes, the mood is, once more, a festive one—but if the lyric is about people going through changes, I rather think Laurie is celebrating the songs that stay with us through thick and thin. This is a party decades in the making, and Didn’t it Rain only gives us further reason to rejoice and be glad. If you're across the pond, you are probably getting a lot more hype for the new album from Hugh Laurie, which is due May 6 in the UK. Didn't It Rain finds Laurie reteaming with producer Joe Henry and most of the original cast who played on the widely acclaimed Let Them Talk. Laurie's YouTube channel is the best bet to get a taste, including a live stream of a session at Abbey Road Studios tomorrow (Fri, May 3). The performance will air at 7pm GMT. Looks as though the release of Didn't It Rain will closely follow the pattern of Let Them Talk – a UK release to be followed in the US (hopefully) later in the year. American fans who can't wait should probably order via Amazon UK (in a variety of formats, including vinyl and and a deluxe book edition). My experience is that their US shipping rates are pretty reasonable compared to other alternatives.